The story of the Mall is the development of a particular space at the symbolic and economic center of the nation's capital. Embodied in that story is the changing face of a nation: how abstract democratic ideals were translated into physical space and transfigured by slavery, secession, urbanization, and by the bureaucratization and expansion of a central, federal power. L'Enfant intended that the city's development would be diffuse and democratic. He dispersed federal and ceremonial spaces throughout the city, gave the states an equal say in the business of memorial-making in the capital, and planned for the coexistence of federal and private industry in the local economy. However, the first large-scale federal development of the Mall, modelled after Andrew Jackson Downing's plan in 1851, bore little resemblance to L'Enfant's plan and can be read as a response to the twin crises of slavery and secession, and to growing anxiety over urbanization. The naturalistic, picturesque gardens planted on the Mall in the latter half of the nineteenth century were meant to affirm the refinement of slaveholding society and to offer a pastoral retreat from the "wilderness of bricks." Urbanization accelerated during the period, and by 1900 the response to it had changed. As John Kasson has noted, the naturalistic retreat (like Central Park, or Downing's Mall) and the grand, geometric Beaux Arts design characteristic of turn-of-the-century urban planning (White City at the 1893 Columbian Exposition, or the 1901 McMillan Plan for D.C.) both offered critiques of city life. But where the former tried to diminish the city and to provide an intimate, pastoral antidote, the latter elevated it and celebrated its massive scale as a symbol of authority and of control. Following the McMillan Plan, and growing out of a corresponding expansion of federal presence and power, the Mall became a monumental and symbolic space. 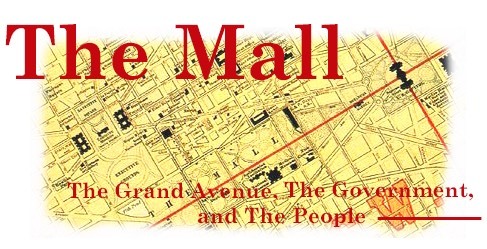 At the same time that private industry (the Central Market, the railroad) disappeared from the Mall, the federal government became the dominant economy of the District. The latest plans for the District prepared by the National Capital Planning Commission represent further expansion of this symbolic, federal themed space.